Washington DC, our nation's capital, is home to the federal government, numerous presidential monuments, memorials to those who served in the military, and cultural organizations such as the Smithsonian Institution. Located between the states of Maryland and Virginia, this is a place of great beauty. The Congress is the legislative branch of government. It consists of two bodies, the House of Representatives with 435 members and the Senate having 100 members. The Congress writes, debates and passes bills that are sent to the President for his approval. With the President's signature, a bill becomes federal law. 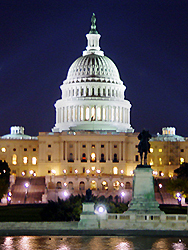 The Congress meets in the Capitol building located at the eastern end of the National Mall upon a hill. For this reason, Congress is frequently referred to as Capitol Hill. Eastchester is represented in Congress by Representative Nita Lowey, Senator Kirsten Gillibrand, and Senator Charles Schumer. Construction on the Capitol was begun in 1793, two years after George Washington selected the site that was to become Washington DC. 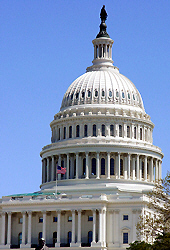 Congress first met in the Capitol on November 17, 1800 although the original building was not completed until 1826. Since then, there have been expansions and restorations to the structure, and the building has been richly decorated with artwork. The President is the chief officer of the executive branch of government and the commander-in-chief of the armed forces. Located at 1600 Pennsylvania Avenue, the White House has been the official home of every president since George Washington. The Oval Office is the White House room in which the president meets with dignitaries, addresses the American people, and conducts his daily business. The president and his vice president routinely meet with the cabinent in the Cabinent Room to discuss the many issues facing the nation. The President shares the White House with his wife, the First Lady. 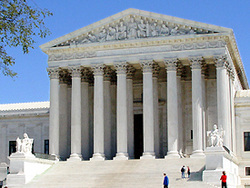 The Supreme Court is the judicial branch of the federal government. Nine justices are appointed by the President and confirmed by the Senate to serve on the Supreme Court for life. The court's greatest power is judicial review, the authority to declare laws unconstitutional. John G. Roberts is our nation's seventeenth and current Chief Justice of the Supreme Court. The current Associate Justices are Antonin Scalia, Anthony Kennedy, Clarence Thomas, Ruth Bader Ginsburg, Stephen Breyer, Samuel Alito, Sonia Sotomayor and Elena Kagan. 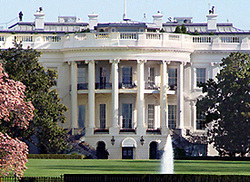 In addition to the federal government, Washington DC is home to numerous monuments to Presidents. Honored presidents include the first President, a founding father, the leader who preserved the union, and the person who served longer in office than any other. The Washington Monument honors George Washington (1732-1799), who earned the title "Father of his country" for his many contributions to our nation's founding. As commander-in-chief of the Continental Army, Washington he lead colonial forces to victory in the war of independence from Great Britain in 1776. Eleven years later, Washington served as President of the Constitutional Convention that lead to the creation of our federal government. George Washington was unanimously elected the first President of the United States in 1789 before his presenting his farewell eight years later. 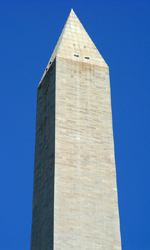 The Washington Monument's story is an interesting one. The original 1845 design was reduced to only an obelisk modeled on that of ancient Egypt. Construction was halted in 1854 due to a lack of money, but was resumed over twenty years later. The structure was finally dedicated in 1885. Today the granite and marble monument is the tallest standing piece of masonry anywhere in the world, with a height of over 555 feet. The Lincoln Memorial commemorates Abraham Lincoln (1809-1865), the 16th President of the United States (1861-1865). 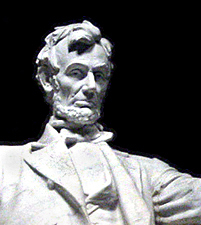 Frequently named as our greatest president, Lincoln lead the nation during the Civil War. Lincoln is remembered for the Emancipation Proclamation which freed the slaves, his moving delivery of the Gettysburg Address, and his powerful writings. Lincoln was assassinated on April 14, 1865 at Ford's Theatre by actor John Wilkes Booth just five days after General Robert E. Lee's surrendered to General U. S. Grant, unofficially ending the Civil War. Located on the east side of the Potomac River, the Lincoln Memorial was designed by Henry Bacon in the style of an ancient Greek temple. The structure consists of 36 Doric columns, each named for a state in the union at the time of Lincoln's death. The memorial was dedicated on Memorial Day in 1922 with the president's surviving son Robert Todd Lincoln in attendance. On August 28, 1963, Dr. Martin Luther King delivered his "I Have A Dream" speech in front of the Lincoln Memorial. The Jefferson Memorial pays tribute to Thomas Jefferson (1743-1826), the third President of the United States (1801-1809). His presidential achievements include appointing John Marshall as Chief Justice of the Supreme Court and obtaining the Louisiana Purchase which moved the nation's western border from the Mississippi River to the eastern Rocky Mountains in 1803. As the author of the Declaration of Independence, Jefferson wrote "all men are created equal." 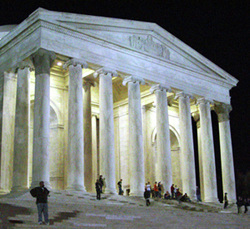 The Jefferson Memorial is a rotunda consisting of 26 Ionic columns with a domed ceiling. Architect John Russell Pope designed the white marble building in the classic Roman style that Jefferson, also an architect, liked. (The Jefferson Memorial looks very similar to the home Jefferson designed at Monticello.) The interior houses a 19 feet tall bronze statue of Jefferson facing toward the White House. Inscriptions from the Declaration of Independence and other writings are found on the memorial's walls. 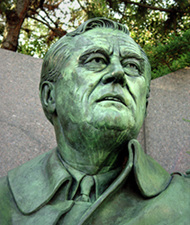 The Roosevelt Memorial remembers Franklin Delano Roosevelt (1882- 1945), the thirty-second and longest serving President of the United States (1933-1945). During his unprecedented four terms in office, Roosevelt faced two great crises. The Great Depression of the 1930's left millions of Americans without jobs and collapsed the banking system. World War II was the most destructive war in human history. President Roosevelt responded with the New Deal program to help the economy and a winning military strategy for the war. He died on April 12, 1945, shortly before the end of World War II in Europe. The Roosevelt Memorial consists of four outdoor rooms, each representing one of Roosevelt's terms in office. The rooms include walls of red South Dakota granite inscribed with the president's quotations, water falls and gardens. Sculptures depict both President Roosevelt and first lady Eleanor Roosevelt. 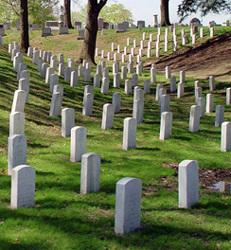 Across the Potomac River in Virginia, Arlington National Cemetry is the burial grounds for over 250,000 veterans, many who died during military conflict, and our political leaders. Among the many notable individuals buried here are President John Fitzgerald Kennedy, President William Howard Taft, Chief Justice Earl Warren, World War II hero Audie Murphy, and Pierre Charles L'Enfant who designed Washington DC. The Tomb of the Unknowns is a white marble sarcophagus contains the remains of unidentified dead from past wars. On the grounds of Arlington National Cemetery is Arlington House, the former home of Confederate general Robert E. Lee. This mansion and surrounding property were confiscated during the Civil War by the federal government for burying the Union's dead. The Korean War Veterans Memorial honors the Americans who fought in the Korean War (1950-1953) with United Nation forces against Communist North Korea. 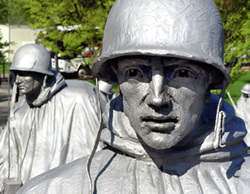 Nineteen statues representing the Army, Navy, Marines and Air Force, and a granite wall with etched photographs adorn the Korean War Veterans Memorial park. This memorial demonstrates that the Korean War is not "the forgotten war" that it has been sometimes called. Other memorials include the African American Civil War Memorial and the Vietnam Veterans Memorial with its wall of names of those who gave their lives. The National World War II Memorial is a tribute to sixteen million Americans who served in that conflict. The US Marine Corp War Memorial depicts the raising of the US flag on the island of Iwo Jima during World War II. The 18 museums of the Smithsonian Institution include the National Museum of American History, the National Museum of Natural History, the National Postal Museum, the American Art Museum, and the National Air and Space Museum. On the National Mall, the National Museum of the American Indian offers exhibits and education programs on the culture, history and art of the Native Peoples of the Americas. The National Zoo and research facilities such as Astrophysical Observatory and the Smithsonian Environmental Research Center are also part of the Smithsonian. 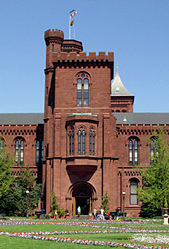 The Smithsonian Institution is the world's largest museum complex. In his last will and testament of 1826, British scientist James Smithson left his estate "to the United States of America, to found at Washington, under the name of the Smithsonian Institution, an establishment for the increase and diffusion of knowledge among men." Following Smithson's death, an Act of Congress was signed by President James Polk on August 10, 1846 to create the Smithsonian Institution. The Smithsonian Institution's popular National Air and Space Museum (NASM) has historic aircraft and spacecraft including the Wright Flyer, the Spirit of St. Louis and the Apollo 11 Command Module. 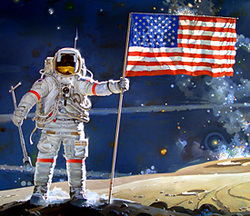 Preserving the history of flight and space exploration, NASM offers 23 main collections with new exhibits opening frequently. Online are archived former showcases and online only exhibitions. NASM also houses the Albert Einstein Planetarium, the Udvar-Hazy Center Imax Theatre and showcases such as Apollo to the Moon and Explore the Universe. The District of Columbia (abbreviated D.C.) is the federal territory in which the city of Washington is located. The nation's capital is not contained within any of the fifty states. The procedure for planning and building the capital became law with the Residence Act of 1790. The federal government relocated from the temporary capital of Philadelphia to Washington DC in 1800. The city of Washington and the District of Columbia are both governed by one municipal government today so both are generally considered to be the same. This has not always been so. The United States Congress, however, has ultimate authory over the District of Columbia. Washington DC is positioned on land that was previously part of Maryland, along the Potomac River. This location was selected by, then named for, George Washington. The federal district was named "Columbia," in tribute to Christopher Columbus, as this had been a suggested name for the United States after the American Revolutionary War ended in 1783. To view a slide show of accompanying photographs, click here.